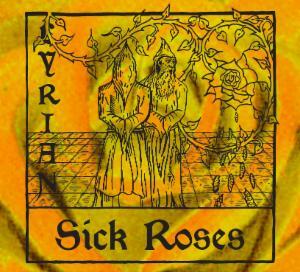 Sick Roses was issued as a single by Lyrian on 1 June 2011. The song concerns the men of God, their changeless minds, their crooked crooks, their fire and iron, their soft, yellow hands. It concludes with a setting of William Blake’s great poem The Sick Rose. The music lies somewhere between Muse and the Muses. A video for the song (a fabulously silly one) can be seen by clicking here. The B-side is a longer song, The Hollow, which describes the chaos of a mind before it falls into the hands of God, or flees from those hands. Both songs are from Lyrian’s double concept album, The Tongues of Men and Angels. Lead-guitarist and lyricist John Blake said “These songs come from our darkest period, when we were railing against the divine. They are also, I think, our best, most musically literate, most lyrically childlike, songs to date”. The single is available now only in physical form for £1.50 from Medieval Records.